My family and I have been vegetarians for several years. We don’t like the way livestock is raised on the industrial farms and filled with antibiotics and other drugs to make cattle grow fast and produce extra meat and milk. We are also careful about the fruit and vegetables we put on our table also because of the industrialized methods of mass producing food. It’s inevitable, however, that food production has fallen into this mode. Our overpopulated world coupled with the changing environment appears to have forced the farming community into new methods of mass producing food to meet a growing demand. But the profit motive has always generated problems in assuring the food that reaches our tables is good for us. I suppose we should not have been surprised when a meal that included a lettuce and fresh vegetable salad caused us several hours of abdominal distress. We were stricken with a mild attack of that old E.coli bug living in the fresh head of lettuce purchased from our local grocery. That my wife carefully pealed back most of the outer layers of that lettuce, and then washed the parts she put in the salad, probably saved us from getting violently sick. There was still enough bacteria clinging to the folds of the leaves, however, to turn our lower intestines into a burning oven from hell about two hours after we ate. How could such a thing happen? Here is a possible scenario: A farm hand was cleaning pig pens with his bare hands on a contaminated pitch fork handle before going into the fields to help load head lettuce for market. He did not stop between jobs to wash his hands. He consequently contaminated every head of lettuce he touched. We bought one of the heads of lettuce. During the time it sat in the back of a truck, under a hot summer sun, the bacteria from his hands multiplied by the millions, filling every part of that warm, moist head of lettuce. Even though the lettuce was probably refrigerated after it was delivered to a buyer, and remained under refrigeration until the moment we ate it, the damage was already done. Without the extra caution taken in our kitchen, the innocent appearing vegetable might have hospitalized us, or worse. I suspect that most people suffer from some form of food poisoning more often than they realize. This mild "flu bug" they think they had, or the gas pains experienced a few hours after eating, are more likely caused by an unwanted bacteria in the food. Blame the heat of global warming for the increase in food contamination. Also blame carelessness on the part of food handlers who don't wash their hands. When I recently worked on a small newspaper in Arizona, there was a sick joke circulating among the staff. We rated the quality of area restaurants by the frequency of times we got stomach aches after eating their food. We joked about it, thinking the worst that could happen to us was a brief period of discomfort and possibly a touch of diarrhea. Now, however, thanks to a new strain of super bug, eating contaminated food is no longer a laughing matter. People are starting to die. Until now an injection of a drug known as colistin has been the “last resort” against the killer E.coli bacterium that has been sweeping the world. Doctors didn’t like to use it because colistin is such a strong medication it attacks the kidneys and has a lot of troublesome side effects. But now this bug has developed a resistance to it. Pharmaceutical companies have been reluctant to invest in new antibiotics. The cost of such investments is high and the profits are almost non-existent because the new drugs are rarely used. The last new antibiotic to be introduced was ceftaroline, which came out in 2010. Within a year a new staph germ emerged that was resistant to ceftaroline. President Obama has made fighting antibiotic resistance a priority for his administration. The drug companies apparently are receiving government assistance for this research. Unfortunately it takes years to find and put such drugs on the market. Bacteria appear to develop resistance to the new drugs as fast as science can create them. E. coli and salmonella have been invading our food for hundreds of years. E.coli is counted among the hardiest of bacterium. My late wife, who worked for years in a hospital laboratory, said she watched E.coli grow after placing a small sample of it in a petri dish. Once in contact with a warm, moist environment the bacterium multiplied so fast she could literally watch it fill the dish. I have to think it grew equally as fast through that warm, moist head of lettuce we ate. After a deadly outbreak of food poisoning at a Milwaukee restaurant, a reporter for a Wisconsin newspaper talked to Charles Kaspar, a microbiologist at the University of Wisconsin about this new super bug. What Kaspar had to say was especially alarming. The new strain of E. coli tolerates an acidic environment, so it is not killed like other bacteria when it enters a human stomach, which is full of gastric acids. By the time it reaches the digestive track in the colon, a hundred cells can multiply into millions. It can multiply so fast that the body's natural defense mechanisms can be overwhelmed if the patient does not seek treatment. 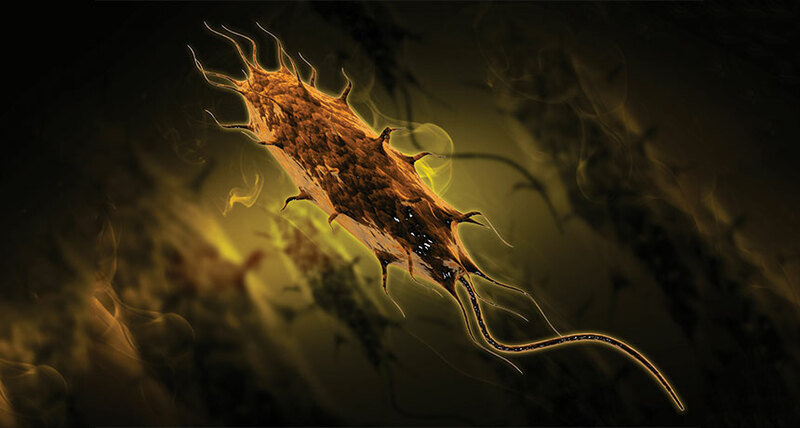 This E. coli bug is most frequently associated with ground beef. But it is present in many other animals and vegetables. This bug has been documented in birds, deer, apple cider, and lettuce. It also has been found in lakes and swimming pools. The bacterium does not seem to make animals sick, but it has a big impact on humans. It is invisible to the naked eye so simply examining meat and vegetables will not help you detect the presence of E.coli. The only way to be sure is to wash everything and then cook the food thoroughly. Make sure the milk and juice you drink is pasteurized and all fruits and vegetables are well-washed if it is to be eaten raw. If you watch the news carefully, especially searching the internet for "real" news reports, you will find some ominous stories about people getting sick and even dying from a variety of super bugs, often linked to something eaten in a fast food restaurant. Our general rule now: Don't eat meat or dairy products for fear of consuming a deadly prion that will eat your brains. And in the vegetable and fruit categories; if you can't peal it, boil it or fry it, don't eat it. The bacteria it harbors might kill you. Due to human carelessness, eating no longer can be considered a pleasant experience. Chalk it up as a daily walk through a field of land mines.